The story that I am about to relate to you happened on a fairly quite midweek night. The sort of night that you wouldn’t normally get any trouble, however you should always expect the unexpected. I was returning to reception from the first floor cabaret room having just watched the show band. As I came down the stairs and turned the corner it was obvious something was kicking off at the main doors. I was scanning around as to assess the situation when a uniformed copper backed into me at speed; he immediately ducked behind me and grabbed the back of my jacket. He was holding on extremely tight and making it very hard for me to move. I was twisting around looking at him and shouting “WTF do you think you are doing” or words to that effect. It was just as well that my head was turned because the next thing I knew a large and sharp object glanced the side of my head. I now realised what the Police Officer was about. He was using me as a shield. Unbeknown to myself, just previous a couple of young lads had been thrown out for some reason. They were pretty drunk and objected to being ejected. They were at the door arguing when a young copper who happened to be passing decided to stick his nose in. He managed to make matters worse and one of the youths happened to smack him whilst he was trying to make an arrest. Somehow they managed to break the glass panel in the doors. “Ha” I hear you say “it should have been unbreakable glass”. We thought it was but technology wasn’t what it is today. You must remember this happened over 30 years ago. Anyway the two arseholes thought it would be good fun to start throwing lumps of glass around. It was at this point that I made my appearance. I seem to have a knack for good timing. As I mentioned my head was turned to the side when struck. I can only think that my afro helped save me from serious injury. ‘Yes an afro’!! Not only did I have hair once, I had a proper Michael Jackson going on! To get back to the story. When the glass hit me I turned my attention to what was happening at the doors. What I saw was two youths trying to gather pieces of glass that they could use as projectiles. Self preservation kicked in and I smashed the policeman’s grip off me and ran at the youths. They immediately took off and split up going in different directions. Now to say I was a fast runner would be an understatement, at that time I had unbeaten school boy records in the 220 and the 100 yards. I’d played outside centre for Warwickshire Colts and on the wing for Coventry Welsh. So yes I could run and especially when chasing someone who had just thrown a lump of glass at me. Because they had gone in different directions, I could only go after the one. He was running around the car park and down the road towards the city centre. He was fast but I was faster and gaining. He kept glancing over his shoulder with a worried look on his face. I caught up with him and ran alongside him for a few paces. I placed my hand on his shoulder and as he was looking at me I steered him into a telegraph pole “Whollop” he didn’t see that coming. He’s flat on his back as I skidded to a holt; he seemed somewhat stunned as I pick him up and begin to frog march him back towards the club. I suddenly hear cheering and receive a round of applause from the bouncers of a rival club the other side of the road. I march him back to the club and hand him over to the Police where he is arrested and charged with assault and criminal damage. My personal study of Kata has become part and parcel of my daily routine. Most mornings you can find me in the local park weather permitting. I could train indoors but I prefer to be outside. The park is usually empty early morning, the airs fresh, there is a feeling of openness and sounds are swallowed up. The Kata or Kata’s I will practice will depend on my personal agenda. The manner of my practice changes according to my needs. 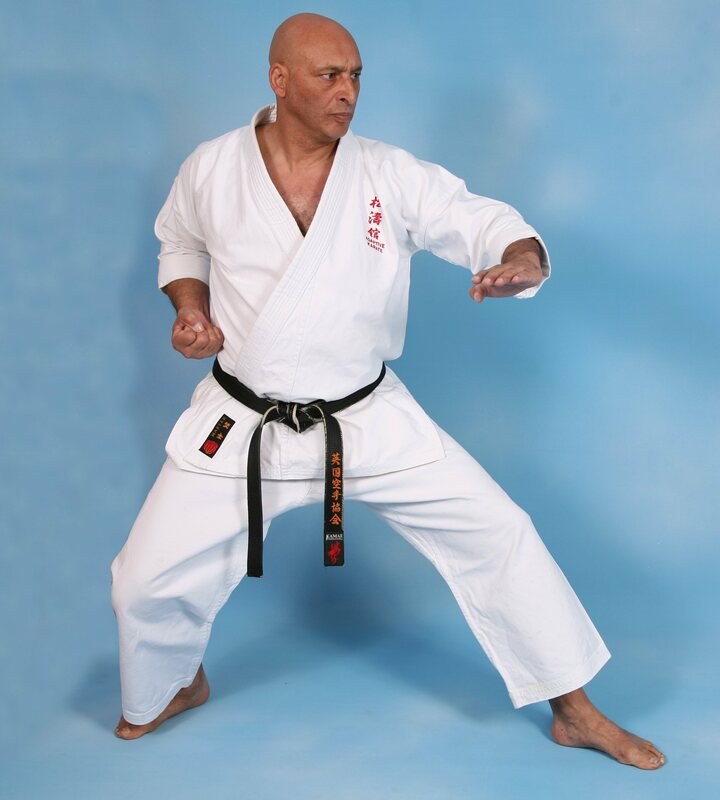 I will not bore you with a catalogue of the various aspects, what I would like to say is the Kata’s appear to take on a mood of their own, they feel so different to a Kata performed in a classroom setting. It’s like bedroom dancing, only with discipline. I find I express myself more freely. There is an edginess, lots of intention and that feeling that my technique has effectiveness. The flow and timing feel different and breathing is more enhanced. That’s maybe because there are no outside influences. I still conform to the Kata, only I feel less restricted. I do not change the Kata; I let the Kata change me. It’s a good start to my day. I am often inspired and energised. When I have done dancing in the park. I know I have vanquished my greatest foe, “myself”. That braves me to ask one further question, “ If martial arts really does make you a better person, how come we have so many arseholes doing it”?